We do not compromise on the quality of equipment serving our customers’ truckload requirements. We have a company owned fleet of approximately 100 late model tractors, 200 dry vans and 100 temperature controlled trailers. 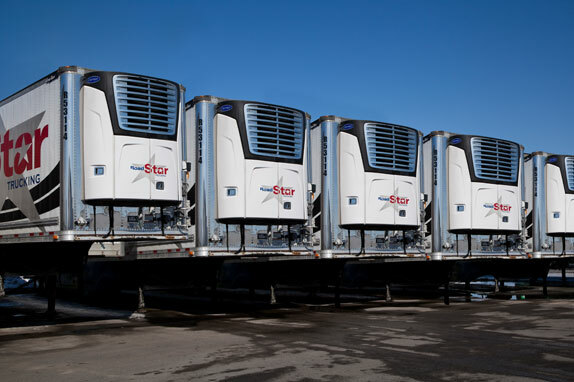 Where we typically run 1000 miles or more, our trailers are equipped with fuel saving side skirts and our tractors have auxiliary power to reduce emissions from idling. Our trailers are logistics equipped so that skids are stacked on rails to create better load optimization and ensure goods travel safely to their destination. We utilize flat floor reefer units and can ship your goods at ambient, cool and frozen temperatures. Our power units are typically Peterbilt and trailers Great Dane. We do not compromise on the quality of equipment serving our customers’ truckload requirements.